As a result of the Soviet invasion of Poland in 1939, hundreds of thousands of Polish soldiers became prisoners of war in the Soviet Union. Many of them were executed; over 20,000 Polish military personnel and civilians perished in the Katyn massacre. 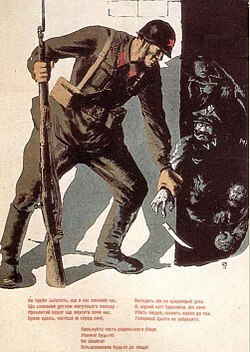 A Soviet propaganda poster urging the civilians to beware of spies; in this case a man in the shadows wearing Polish officers parade uniform. On September 17, 1939, the Red Army invaded the territory of Poland from the east. The invasion took place while Poland was already sustaining serious defeats in the wake of the German attack on the country that started on September 1, 1939. The Soviets moved to safeguard their claims in accordance with the Molotov–Ribbentrop Pact. During the Red Army's rapid advance, about 6,000–7,000 Polish soldiers died in the fighting, 230,000–450,000 were taken prisoner—230,000 immediately after the campaign and 70,000 more when the Soviets annexed the Baltic States and assumed custody of Polish troops interned there. The Soviets often failed to honour the terms of surrender. In some cases, they promised Polish soldiers freedom after capitulation and then arrested them when they laid down their arms. Some Polish soldiers were murdered shortly after capture, like General Józef Olszyna-Wilczyński, who was taken prisoner, interrogated and shot on September 22, during the invasion itself. On September 24, the Soviets murdered forty-two staff and patients at a Polish military hospital in the village of Grabowiec near Zamość. After a tactical Polish victory at the battle of Szack on September 28, where the combined Korpus Ochrony Pogranicza (KOP) or Border Protection Corps forces, under General Wilhelm Orlik-Rueckemann, routed the Soviet 52nd Rifle Division, the Soviets executed all the Polish officers they captured. The Soviets also executed hundreds of defenders at Grodno, the exact number of those killed has not been established. Some Polish prisoners were freed or escaped, but 125,000 found themselves incarcerated in prison camps run by the NKVD. Of these, the Soviet authorities released 42,400 soldiers (mostly soldiers of Ukrainian and Belarusian ethnicity serving in the Polish army who lived in the former Polish territories now annexed by the Soviet Union) in October. 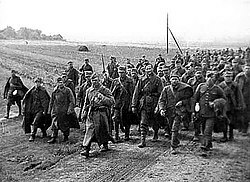 The 43,000 soldiers born in West Poland, then under German control, were transferred to the Germans; in turn the Soviets received 13,575 Polish prisoners from the Germans. Poland and the Soviet Union never officially declared war on each other in 1939; the Soviets effectively broke off diplomatic relations when they withdrew recognition of the Polish government at the start of the invasion. The Soviets regarded captured Polish military personnel not as prisoners-of-war, but as counter-revolutionaries resisting the legal Soviet reclamation of western Ukraine and West Belarus. The USSR refused to allow Red Cross supervision of prisoners - on the grounds that it had not signed the 1929 Geneva Convention on the Treatment of PoWs and did not recognise the Hague Convention. The Soviet military handed the Polish prisoners over to the Narodnyy komissariat vnutrennikh del (People's Commissariat of Internal Affairs, better known as the NKVD or secret police), they received sentences under clauses in the Soviet penal code relating to crimes including treason and counter-revolution, and were not considered subject to the "Regulations for the Treatment of Prisoners of War" approved by the Soviet Council of Ministers. As early as September 19, 1939, the People's Commissar for Internal Affairs and First Rank Commissar of State Security, Lavrenty Beria, ordered the NKVD to create the Administration for Affairs of Prisoners of War and Internees to manage Polish prisoners. The NKVD took custody of Polish prisoners from the Red Army and proceeded to organize a network of reception centers and transit camps and to arrange rail transport to prisoner-of-war camps in the western USSR. The camps were located at Jukhnovo (Babynino rail station), Yuzhe (Talitsy), Kozelsk, Kozelshchyna, Oranki, Ostashkov (Stolbnyi Island on Seliger Lake near Ostashkov), Tyotkino rail station (56 mi/90 km from Putyvl), Starobielsk, Vologda (Zaenikevo rail station) and Gryazovets. 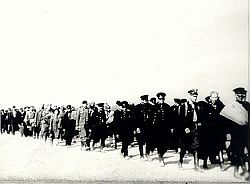 According to a report from 19 November 1939, the NKVD had about 40,000 Polish POWs: about 8,000-8,500 officers and warrant officers, 6,000–6,500 police officers and 25,000 soldiers and NCOs who were still being held as POWs. [not in citation given] In December, a wave of arrests took into custody some Polish officers who were not yet imprisoned; Ivan Serov reported to Lavrentiy Beria on 3 December that "in all, 1,057 former officers of the Polish Army had been arrested". The 25,000 soldiers and non-commissioned officers were assigned to forced labor (road construction, heavy metallurgy). Once at the camps, from October 1939 to February 1940, the Poles were subjected to lengthy interrogations and constant political agitation by NKVD officers such as Vasily Zarubin. The Soviets encouraged the Poles to believe they would be released, but the interviews were in effect a selection process to determine who would live and who would die. According to NKVD reports, the prisoners could not be induced to adopt a pro-Soviet attitude. They were declared "hardened and uncompromising enemies of Soviet authority". On March 5, 1940, a note to Joseph Stalin from Beria saw the members of the Soviet Politburo — Stalin, Vyacheslav Molotov, Lazar Kaganovich, Mikhail Kalinin, Kliment Voroshilov, Anastas Mikoyan and Beria — sign an order for the execution of 25,700 Polish "nationalists and counter-revolutionaries" kept at camps and prisons in occupied western Ukraine and Belarus. This execution became known as the Katyn massacre. Diplomatic relations were, however, re-established in 1941 after the German invasion of the Soviet Union forced Joseph Stalin to look for allies. 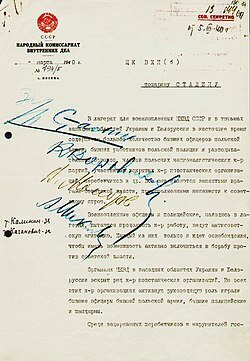 Thus the military agreement from August 14 and subsequent Sikorski–Mayski Agreement from August 17, 1941, resulted in Stalin agreeing to declare the Molotov–Ribbentrop Pact in relation to Poland null and void, and release tens of thousands of Polish prisoners-of-war held in Soviet camps. Pursuant to an agreement between the Polish government-in-exile and Stalin, the Soviets granted "amnesty" to many Polish citizens, from whom a military force was formed. Stalin also agreed that this military force would be subordinate to the Polish government-in-exile. This force was known as the Anders Army. From 1943 Poles were recruited into the Berling Army. The third group of Polish prisoners were members of Polish resistance organizations (Armia Krajowa, or 'cursed soldiers') loyal to the Polish government-in-exile and seen by the Soviets as a threat to their establishment of a power base in Poland. Relatively few were sent to the Soviet Union (although there were notable exceptions, see Trial of the Sixteen); most were transferred to the Polish communist security forces and prisons, or enlisted in the Berling Army. Bronisław Babiański - Major General in the Polish Army of the Second Polish Republic. In September 1939, when the German Army and the Soviet Army invaded Poland, he moved to Grodno, where he was captured by the NKVD a month later. He has been missing since then, presumably killed by the NKVD. Leon Billewicz - Brigadier General, seized by the Soviets in Żurawno nearby Stryi on 19 September 1939 along with the hastily organized Polish units heading toward Polish-Hungarian border. He was detained in Starobielsk and executed in Kharkiv. Bronisław Bohatyrewicz - Brigadier General, he had retired from the Army before 1939, nevertheless was arrested in September 1939 and deported to the camp in Kozielsk and subsequently murdered in the Katyń massacre. He was one of only two generals identified during exhumation in 1943. Alexandre Chkheidze - Brigadier General, was detained by the NKVD in Lviv, September 1939, as the 'enemy of people'. He was replaced to Kiev in June 1940 and accused of list of 'crimes'. The last trace of the general is receipt put by the commander of convoy in December 1940. The general was likely shot by a firing squad in Moscow in 1941. Xavery Czernicki - Rear Admiral, he shared common lot of Polish officers detained by the Soviets. Having crossed thresholds of Ostaszków, Starobielsk, Kozielsk Soviet camp, he was eventually murdered in the Katyń massacre. Kazimierz Dzierżanowski - Lieutenant General, captured by the NKVD in Lviv, in October 1939, afterwards relocated to Kiev in 1940. His fate is unknown, but he is suspected to have died of exhaustion in the Kiev prison. Stanisław Haller de Hallenburg - Lieutenant General, arrested in 1939 and imprisoned in Starobielsk. In 1941, when Władysław Sikorski had issued the order to form Polish Army in the Soviet Union after the outbreak of war between Germany and the Soviet Union, Stanisław Haller was to be appointed the Commander in Chief of that army. Oblivious to Sikorski, Haller had been dead since 1940, when he fell victim to the Katyń massacre. Kazimierz Horoszkiewicz - nominal Lieutenant General in the Polish Army of the Second Polish Republic, in September 1939, eluding the Germans he arrived to Lviv, at that time already under the Soviet occupation. Having been sent to Siberia, Horoszkiewicz had died in Tobolsk on his way back to the west, to newly formed Polish units in the Soviet Union in 1942. Albin Jasiński - Brigadier General, organized Polish Self-Defence units in Drohiczyn against the Soviet oppression in 1939. He was detained by the NKVD, and died in 1940 during tortures inflicted by the NKVD interrogators. Aleksander Walenty Jasiński - Brigadier General, he disappeared after the Soviets had entered Lviv. His fate has been unknown since. Marian Jasiński - nominal Brigadier General, he has been lost from the Soviet invasion, likely killed by the Soviets. Adolf Karol Jastrzębski - Brigadier General, imprisoned by the Soviets, sent to gulag in Vologda, died of hard labour, exhaustion and hunger. Władysław Jędrzejewski - Lieutenant General, he was organizing the Self-Defence units in Lviv, when the Soviet army entered the city. He was executed in 1940 by the NKVD. Władysław Jung - Lieutenant General, the Soviet aggression caught him in Lviv. He made failed attempt to cross the German-Soviet demarcation line in 1939. Kept in prison on severe cold, he died of gangrene. Juliusz Klemens Kolmer - Brigadier General, arrested by NKVD in Lviv, 1940. He was presumably killed by the Soviets. Aleksander Kowalewski - Brigadier General, he prepared operation group in Podolia during September Campaign in 1939. When the news of the Soviet invasion had reached him, General Kowalewski set off on the southeastern direction, where he clashed with approaching Soviet army. In the meantime, General of the Armies announced the directive not to engage Soviets unless provoked. General Kowalewski followed the order and capitulated to Soviets. Imprisoned and relocated to Starobielsk, murdered in Kharkiv in 1940. Szymon Kurz - Brigadier General, arrested in November 1939 by the NKVD. Executed in the spring of 1940. Kazimierz Orlik-Łukoski - Major General, was captured during the German–Soviet invasion and later turned over to the NKVD. He was imprisoned in Starobielsk, and later killed in the Katyń massacre. ^ a b c d Fischer, Benjamin B., "The Katyn Controversy: Stalin's Killing Field", Studies in Intelligence, Winter 1999-2000. ^ a b c d Sanford, Google Books, p. 20–24. ^ Stanley S. Seidner, Marshal Edward Śmigły-Rydz Rydz and the Defense of Poland, New York, 1978. ^ a b c (in Polish) Edukacja Humanistyczna w wojsku Archived 2007-01-10 at the Wayback Machine. 1/2005. Dom wydawniczy Wojska Polskiego. ISSN 1734-6584. (Official publication of the Polish Army). Retrieved 28 November 2006. ^ (in Polish) obozy jenieckie żołnierzy polskich (Prison camps for Polish soldiers) Encyklopedia PWN. Retrieved 28 November 2006. ^ (in Polish) Olszyna-Wilczyński Józef Konstanty, entry at Encyklopedia PWN. Retrieved 14 November 2006. ^ (in Polish) "Archived copy". Archived from the original on January 7, 2005. Retrieved January 7, 2005. CS1 maint: Archived copy as title (link) CS1 maint: Unfit url (link) Polish Institute of National Remembrance. 16.10.03. From Internet Archive. ^ (in Polish) Tygodnik Zamojskim[permanent dead link], 15 September 2004. Retrieved 28 November 2006. ^ (in Polish) Szack. Encyklopedia Interia. Retrieved 28 November 2006. ^ Decision to commence investigation into Katyn Massacre, Małgorzata Kużniar-Plota, Departmental Commission for the Prosecution of Crimes against the Polish Nation, Warsaw 30 November 2004. "[...] some 250,000 Polish soldiers were taken into Soviet captivity. Some of them were released, and some escaped, but 125,400 prisoners were placed in NKVD prison camps in Kozelsk, Ostashkov, Starobelsk, Putivl, Yuzha, Oranki, Kozelshchina, and elsewhere." ^ George Sanford (2005). Katyn and the Soviet massacre of 1940: truth, justice and memory. Psychology Press. p. 44. ISBN 978-0-415-33873-8. Retrieved 7 May 2011. ^ a b c d e Alfred J. Rieber (2000). Forced migration in Central and Eastern Europe, 1939-1950. Psychology Press. pp. 31–33. ISBN 978-0-7146-5132-3. Retrieved 19 May 2011. ^ a b c Simon-Dubnow-Institut für Jüdische Geschichte und Kultur (2007). Shared history, divided memory: Jews and others in Soviet-occupied Poland, 1939-1941. Leipziger Universitätsverlag. p. 180. ISBN 978-3-86583-240-5. Retrieved 19 May 2011. ^ See telegrams: No. 317 Archived 2009-11-07 at the Wayback Machine of September 10: Schulenburg, the German ambassador in the Soviet Union, to the German Foreign Office. Moscow, 10 September 1939-9:40 p.m.; No. 371 Archived 2007-04-30 at the Wayback Machine of 16 September; No. 372 Archived 2007-04-30 at the Wayback Machine of 17 September Source: The Avalon Project at Yale Law School. Last accessed on 14 November 2006; (in Polish)1939 wrzesień 17, Moskwa Nota rządu sowieckiego nie przyjęta przez ambasadora Wacława Grzybowskiego (Note of the Soviet government to the Polish government on 17 September 1939 refused by Polish ambassador Wacław Grzybowski). Retrieved 15 November 2006. ^ Sanford, pp. 22–3; See also, Sanford, p 39: "The Soviet Union's invasion and occupation of Eastern Poland in September 1939 was a clear act of aggression in international law...But the Soviets did not declare war, nor did the Poles respond with a declaration of war. As a result there was confusion over the status of soldiers taken captive and whether they qualified for treatment as PoWs. Jurists consider that the absence of a formal declaration of war does not absolve a power from the obligations of civilised conduct towards PoWs. On the contrary, failure to do so makes those involved, both leaders and operational subordinates, liable to charges of War Crimes and Crimes against Humanity." ^ Sanford, p. 25 and p. 41. ^ Anna M. Cienciala; Wojciech Materski (2007). Katyn: a crime without punishment. Yale University Press. p. 81. ISBN 978-0-300-10851-4. Retrieved 19 May 2011. ^ (in Russian) Катынь. Пленники необъявленной войны. сб.док. М., МФ "Демократия": 1999, сс.20–21, 208–210. ^ "The Katyn Diary of Leon Gladun", last accessed on 19 December 2005, English translation of Polish document. See the entries on 25 December 1939 and 3 April 1940. ^ "In relation to Poland the effects of the pact have been abrogated on the basis of the Sikorski-Mayski agreement". The epilogue to September 1939 – Polish soldiers in Soviet captivity - testimonies of Polish POW's in Soviet Union; "Chronicles of Terror"
This page was last edited on 10 February 2019, at 19:28 (UTC).